At first glance, the story of the Onan Corporation is a story of machines — initially machines that helped people do their jobs of repairing automotive parts and components better. But a long, careful look into the history of the Onan Corporation shows that it really is a story of people, unusual people who dedicated their lives to building better machines, but who gave an even higher priority to the people around them. This all started because the founder, the late David W. Onan, who was a mechanical genius, was above all a humanitarian. His amazing ability with machinery has resulted in a major company with operations throughout the world, but those who remember him, his family, friends and co-workers-remember him mostly for his compassionate regard for people with whom he came in contact. His warm feeling for people has been contagious with others at Onan throughout the history of the company. Dave Onan, or D.W. as most of his associates called him, was a giant of a man, both figuratively and literally. A Fortune Magazine article in 1943 described him as “so big and broad that he sometimes seems larger than life”. A native of Minnesota, D.W. Onan moved to the East as a teenager, but his quest for a better opportunity lured him back to the state of his birth while still a young man. 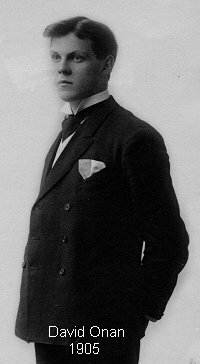 He was born on July 4, 1886, in Moorhead, MN, the second of four sons of David and Ellen Onan. [Ed. His father was named Edward. A mistake he made once and was often repeated by others.] His father was a railroad worker, who put in long hours on the job but still had time to putter with machinery around the house, helping plant a mechanical seed in young Dave that flourished in the years to come. Life in the last years of the Nineteenth Century in the Red River Valley was austere and rather unexciting for a youngster, unless, like young Dave Onan, you were blessed with a vivid imagination and could build things out of nothing but scrap. Dave created his own excitement:, both at his home in Moorhead and later on when the family moved to Wahpeton, N.D., where his father was transferred. When young Dave was 14, his father died, and Ellen Onan took her four sons to Niagara Falls, N.Y., which was her original home. [Ed. Ellen Morris Onan was born 1858 in Chesterfield County, VA] That was 1900, and it fell upon Dave and his brothers to help support the fatherless family. Dave never was fond of school, so dropping out to work, especially because it was a necessity, was not an unpleasant experience. His first job there was helping to build a power plant for the Niagara Fails Power & Light Co., but in a couple of years, when Dave was 16, he landed a better job as a streetcar conductor. He loved that work, especially the close contact with people, and though he wanted to stay in that type of job, Dave wasn’t happy with the East. He kept thinking of his childhood in Minnesota and yearned to return. Shortly after his 19th birthday, Dave decided the time was ripe to return to his native state; he was certain he could get a job as a streetcar conductor in either Minneapolis or St. Paul, so in mid-1905 he bought a railroad ticket to the Twin Cities and headed west. It wasn’t unusual for young men from the East to travel to Minnesota to seek their fortunes in the early years of the Twentieth Century. Minnesota was the land of opportunity in those days. Business tycoons like James J. Hill, Frederick Weyerhaeuser and George Draper Dayton were establishing national reputations from their bases in Minnesota. Mushrooming companies such as Washburn Crosby (now General Mills), Pillsbury, Cargill, Peavey, Minnesota Mining and Manufacturing, and the Electric Heat Regulator Co. (now Honeywell) were providing jobs for eager young men from all parts of the East. Though jobs were plentiful, Dave Onan wasn’t able to find one as a streetcar conductor in the Twin Cities when he arrived. Undaunted, he accepted a job as manager of a roller skating rink in South St. Paul, not exactly the answer to his dream, but it was steady, pleasant work. It was at the roller skating rink where Dave met Emily Roman, a young woman who lived in the neighborhood. They were married in 1907. Due to his interest in mechanics, Dave Onan soon decided his abilities would be better tested in the growing automobile industry. He accepted a job with the P. J. Downes Co., distributors of Rambler Motor Cars, selling and servicing them. The automobile business in the first decade of the 1900s was vastly different from what it is today. There were very few dealers, most of them headquartered in major cities, and service stations as we know than were non-existent. It was not uncommon for Dave Onan to sell an auto to someone hundreds of miles away, and then have the problem of delivering it, often driving it for miles across fields in areas where there were no roads. 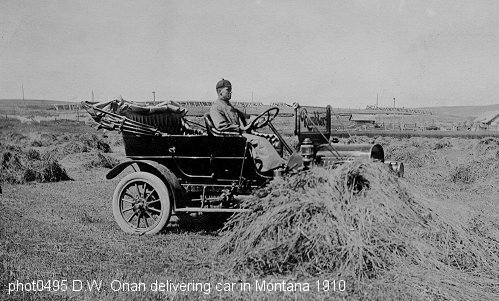 In the Onan Corp. archives there is a photo of D.W. Onan taken in 1908, showing him driving a two-cylinder Rambler, with chain drive, across an alfalfa field near Judith Basin, Montana. Onan went by train with the auto from the Twin Cities to Montana, but he had to drive 200 miles cross-country to deliver the auto to the owner. When an auto broke down, it was up to the owner to remove the part that wasn’t working and to ship it back to the dealer, or to some distant repair shop, to have it fixed. The logistical problems of repairing an auto intrigued D.W. Onan. He thought there was an opportunity for a special business, doing nothing but repairing broken parts of an automobile, or motor cars as they were called then. Without funds to start such a business, Onan did the next best thing. He took a job in 1909 with the Hollis Co., in Minneapolis, a wholesaler of motor car accessories and garage equipment. Shortly after he joined the firm, the name was changed to Reinhard Brothers Co. It wasn’t long before Onan convinced the owners of the company that a special department involved only in repairing the electrical parts of a motor car would be a profitable addition to the Reinhard business. Onan, naturally, was put in charge. It was his first opportunity to prove to himself he was exceptionally skilled, not only in mechanical matters, but in organizing a business, in marketing, and in managing people. Within 10 years, Onan, now called the superintendent of the Reinhard Electrical Repair Department, was supervising 50 mechanics and turning out from 100 to 125 repair jobs a day. The repair shop and storeroom for spare parts occupied the entire fourth floor of the Reinhard building. Onan’s original ideas of how to operate a repair business resulted in such efficiency that competitors simply were unable to compete either in service or price. Motor car dealers from states throughout the central part of the U.S. routinely sent broken electrical parts to Reinhard, knowing they would be satisfied with the quality of repair, the speedy return and the price. Onan personally trained each of the mechanics working for him. It’s notable that of the 50 workmen he had in 1919, only one had been a motor car repairman before being hired by Onan. The men had been plumbers, mechanics in other fields, telephone repairmen, or just people with a mechanical aptitude. Once hired, they seldom left Onan’s shop. For many years the labor turnover in his department averaged less than one percent a year. Everything in Onan’s shop was highly organized for utmost efficiency. The tool room was located in the center of the room, and tools were issued to mechanics only when they presented a written request, which was kept on file until the tool was returned. Each workman had his own well-lighted bench equipped with the necessary electric wiring and testing equipment. Onan insisted that all units to be repaired had to be disassembled in a seamless iron pan to keep every part, large and small, in one receptacle until it was ready to be put back together, making certain nothing would get lost. As the various units arrived for repair, they were placed in numbered compartments and taken for repair in the order they were received, always on a first-come, first-served basis, so they could be returned as quickly as possible. With several hundred parts usually waiting for repair, his system was necessary to ensure prompt attention. Onan’s storeroom had $50,000 to $60,000 worth of spare parts with his inventory constantly being replaced so no unit had to wait for necessary parts. His stock included repair parts for starting, lighting and ignition equipment on every motor car ever manufactured. Although Onan’s repair shop was only a part of the Reinhard Brothers operations, it was the fastest growing, and most profitable, part. The Reinhard building, located on 28th street, between Hennepin and Nicollet Avenues, was quickly being converted from a warehouse for motor accessories to a repair business under D.W. Onan’s supervision. But Onan wasn’t satisfied with working for someone else. He was too independent to be happy as a hired hand. He also was too energetic to be involved only in one enterprise. During World War I, he taught mechanics at the Dunwoody Institute in Minneapolis, and in his spare time worked on several different mechanical inventions, most of them having to do with motor cars, in the basement of his home at 1331 Penn Avenue North. He also was active in service club work and was a devoted family man. He and Emily Onan were the parents of three children, sons Charles Warren (Bud) and Robert D. and a daughter, Geraldine. David Onan’s driving ambition, during ail these early years, was to have a business of his own. He was soon to realize that ambition.